I really like reading books that are written in the first person, because it gives me a chance to get inside someone else’s head. I think it’s the most intimate sort of reading experience. So, it only makes sense for me to write in the first person as well. It’s what comes naturally for me. The problem is, it’s limiting. One main character has to be in every scene in the book. The only way around that is to write from multiple character perspectives. That’s what I did for Starring in the Movie of My Life. It was difficult at first, but it never occurred to me to do it any other way. The story always belonged to both Samantha and Melody. Since I love writing in first person, alternating their points of view was pretty fun. The most exciting chapters to write were the ones where the two of them were together in the same room. I loved observing Samantha through the Melody’s eyes, or vice-versa. However, most of the chapters featured only one of them. At times it was easier for me to write for Melody, and at times Samantha’s chapters came easier. I guess I sort of went through phases. However, I always enjoyed developing both of them, trying to make them real. I started by giving them a heroic quality. Samantha was extremely compassionate, and Melody was the ultimate survivor. I know a lot of readers found Melody to be pretty unlikeable, but in a weird way I’m protective of her. However, I guess Samantha is my favorite because she has such a big heart and potential strength. Of the major characters, I’d have to say Nathan is my least favorite. It’s not his fault, but I don’t think he grows over the course of the story the way the others do. Anyway, the most difficult part was attention to detail; how do I make Melody and Samantha sound like two different people through word choice and response to conflict? In the end I’m not sure how good I was at it, but I haven’t gotten any complaints, so I’m hoping I did okay. The book I’m working on now, November Surprise, is written in the first person, but there’s only one character who narrates. However, it’s told in vignettes, and takes place over the course of twenty years. So I’m trying to be cognizant of how Lucy will change over time, her maturity, her perspective, etc. Also, what will stay the same? In some ways this is more difficult than having two narrators. But I’m a writing geek, so I love the challenge. 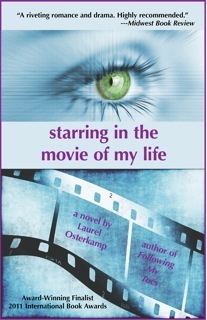 Laurel Osterkamp’s first novel, Following My Toes, (PMI Books) won the 2008 National Indie Book Award for Excellence (Chick Lit category). She drew on her on her experiences as a high school teacher and creative writing teacher as she wrote Starring in the Movie of My Life. She lives in Minneapolis with her husband, son, and daughter, and is working on her third novel. Samantha acts without thinking. Her heart is huge while her sense of purpose is small; she's willing to fight for those she loves, but she's never learned to fight for herself. Eighteen-year-old Melody is cold and calculating, and she's driven by the desire to better herself. As these compelling yet deeply flawed women battle for the affections of 25-year-old Nathan, he becomes increasingly confused and torn between them. Nathan is Melody's English teacher, and after he saves her from being raped, she becomes attached. Melody longs for the affection she's never felt, so she involves people in her self-invented drama, making sure she is at once the star and the director. Meanwhile, Samantha is newly married to Nathan. But Samantha has hang-ups about motherhood and lingering feelings for her ex. To make sense of the world, Sam relates her life to the themes of her favorite movies, while she independently makes a documentary to jump-start her non-existent film career. Stylistically influenced by Jodi Picoult and Jennifer Weiner, Starring in the Movie of my Life is told old alternately from both Samantha's and Melody's points-of-view and relates two complete yet combined stories about love, acceptance, and redemption. It speaks to our universal desire to be saved by the ones we love, and the monumental effort required to save ourselves. Sounds like you had a great time writing this book, it seems really interesting. I think it's better to write in first person because the author can get to know more the character and I've read from other authors that sometimes characters "surprise" them.